If it were not for the gravitational attraction of the Sun and the Moon, the water level of the seas and oceans would be kept at equal levels by a combination of the Earth’s own gravity pulling it inwards and centrifugal force pushing it outwards. However, the gravitational force of the Moon is strong enough to attract the water towards it and cause a bulge beneath it. As the Earth rotates and the Moon orbits around it, the bulge follows the Moon causing high tides in its vicinity. The combined effects of the Earth’s rotation and the Moon’s orbit around it, cause the ‘bulge’ to move around the Earth in 24 hours and 50 minutes and so it would seem at first sight that we would get high tides only at that time interval. However, other forces are at play. On the opposite side of the Earth to where the ‘bulge’ occurs, the Moon’s gravitational pull is at its weakest and this allows the Earth’s centrifugal force to push the water outwards and so cause another bulge there giving us two high tides a day. This means that the time between high tides is approximately 12 hours and 25 minutes and the time between high tide and low tide is 6 hours 12.5 minutes in deep ocean areas. This can change dramatically owing to a variety of factors such as the topography of the ocean floor, local currents, varying water depths and the declination of the Moon. Tidal Effects of the Sun. The Sun also affects the rise and fall of the tides on Earth. The gravitational attraction of the Sun pulls the ocean water towards it but at the same time, the effect of the Earth’s rotation around the Sun creates a centrifugal force which pushes the water outwards on the side facing away from the Sun. The combined effect of these two forces creates a tidal bulge on the side of the Earth facing away from the Sun. However, this effect of the Sun is less than that created by the Moon which is much closer to the Earth. Spring Tides. When the Sun, the Moon and the Earth are in syzygy, that is when they are lined up as during a Full Moon or New Moon, the combined tidal effect of the Sun and Moon is at its greatest and causes what is known as Spring Tides. This has nothing to do with the season of Spring but to do with the saying that the water ‘springs’ higher than normal. Neap Tides. 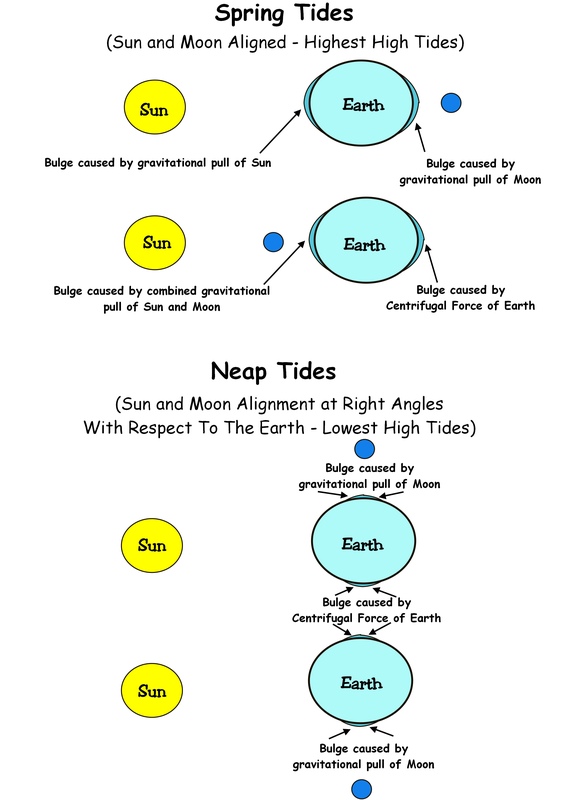 When the directions of the Sun and the Moon in relation to the Earth are at right angles, as during a Half Moon, the combined effects of their gravitational pull is less and so the height of the tides is much lower and are known as Neap Tides. Links: Lunar Distance Phases of the Moon Altitude Corrections for the Moon. This entry was posted in astro navigation, astronomy, celestial navigation, navigation and tagged astro navigation, astronomy, celestial navigation, navigation. Bookmark the permalink.